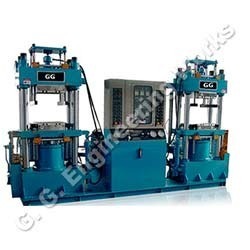 Prominent & Leading Manufacturer from Mumbai, we offer rubber moulding hydraulic press. Highly committed towards the quality production, our organization in engaged in offering an outstanding array of Rubber Moulding Hydraulic Press. Our highly skilled technocrats manufacture this press by making use of the best quality components and the pioneering technology at par with the industry quality standards. Used for molding rubber in numerous kinds of shapes, the offered hydraulic press is most commonly demanded press in the engineering applications. Besides, clients can avail this hydraulic press at negotiable prices from us.